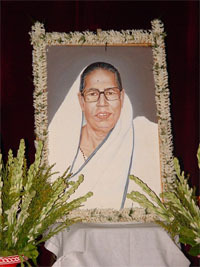 The late Sona Bala Devi was a devoted social worker. She worked tirelessly for the deprived class of people very quietly. 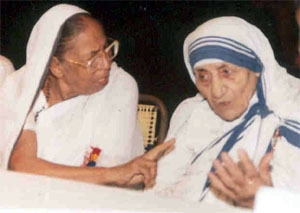 S. B. Devi Charity Home was named in honour of that great lady. The organisation is the child of her dream. The story began many years ago. The sensitive lady thought about the mischief of treatment of the destitute people. The increasing expense for medical treatment was leading them to a horrible fate. S. B. Devi planned to start a charitable clinic for the welfare of this deprived class. She expressed her noble resolution to her sons staying in Switzerland. At that time Chandon Chattopadhyay, her grandson, was the President of the Student Association of Basel University. Sekhar Chattopadhyay, a son of S. B. Devi, residing in India, had a discussion with Chandon Chattopadhyay on this matter. The General Body meeting of International Federation of Medical Students Association (IFMSA) was to be held at Prague in the Czech Republic. Chandon Chattopadhyay attended the meeting and placed before the IFMSA the proposal of starting a project in India. IFMSA responded enthusiastically. Then he presented the proposal to the students in Basel University. They became very eager to take total responsibility for the proposed project. Finally representatives from Switzerland visited Kolkata and from Kolkata representatives went to Switzerland to discuss the proposal. In the year of 1989 two societies were formed at Kolkata and Basel; S. B. Devi Charity Home and Calcutta Project Basel. An agreement was signed between these two institutions with responsibilities of each organisation clearly stated. The agreement is reviewed every five years and extended. Calcutta Project Basel is mainly responsible for fundraising and forwarding know how and S. B. Devi Charity Home is responsible for implementation. After the foundation of both societies in 1989, an application was made for registration. S. B. Devi Charity Home was registered by the State Government on 10th of July, 1991. That was the first step towards a new horizon. The society is licensed under the West Bengal Clinical Establishments Act, License No: L/634-(97)-06/668 dated 28.11.2006. The organisation is now also registered under Foreign Contribution (Regulation) Act 1976, Ministry of Home Affairs, Government of India. Initially S. B. Devi Charity Home was operated from only one room. S. B. Devi offered the salon on the ground floor of her residence for the project. The same room was used for the clinic as well as official purposes. 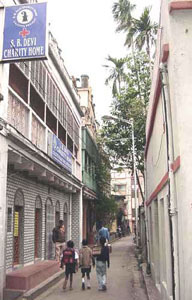 In 1999 Dr. Chandon Chattopadhyay purchased the adjacent building with the help of Calcutta Project Basel. Suggestions and opinions were taken from members, well-wishers and experts before renovating the building. A survey was organised to collect suggestions from local people. Despite some major obstacles the building was completed on the 21st January 2002. His Excellency, Mr. Viren J. Shah, Governor of West Bengal, agreed to inaugurate the New Building.